Gert finally realizes that being such a murderous maniac might be the reason she’s not been able to find her way out of the candy-coated world of Fairyland that has been her nightmare for over forty years. She sets off on a new quest to redeem herself and tries to earn her way back home with good deeds and kindness and love an whatever other mushy, touchy-feely things she can manage. Collecting issues 11 through 15. This volume felt a little less episodic than the previous one, but still seemed to jump from one scenario to the faster and faster to get to the end of the story arc. However, SPOILER ALERT after having a revelation that being her usual murderous self may not actually be working in her favor, Gert changes her ways and finally finds her key, and all looks like it is finally working in Gert's favor, but of course this is Skottie Young and he can't let Gert off that easily. The twist at the end was spot on perfect for this series, and I can't wait to see how this next story arc plays out. 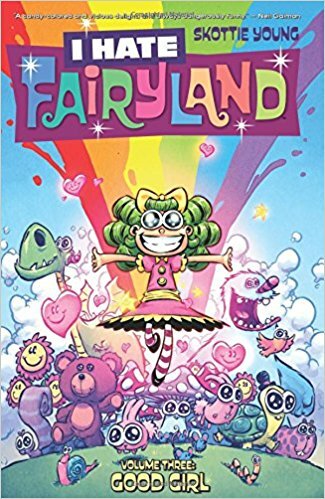 Full of Young's typical dark humor and wildly outrageous art, and Nate Piekos continues to explode retinas with his eyeball-popping colors, I Hate Fairyland continues to be one of my favorite series coming out of Image these days. Now Beatrice has one last shot at answers… and at life. OK, so I've now been trying to write a review that doesn't give anything away about this book, and I can't. So I'll just give you my general impressions about aspects of the book. 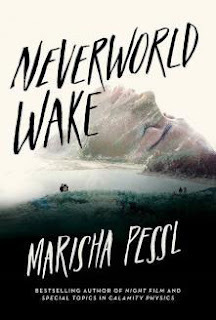 I've been sitting on my review of Marisha Pessl's Neverworld Wake for a couple of days now, wondering how I wanted to write this. On the one hand, this is typical Pessl, with a twisting, unpredictable story that doesn't necessarily end up where you think it will. On the other, this is Pessl's first foray into YA, and I think it suffered a little from that. 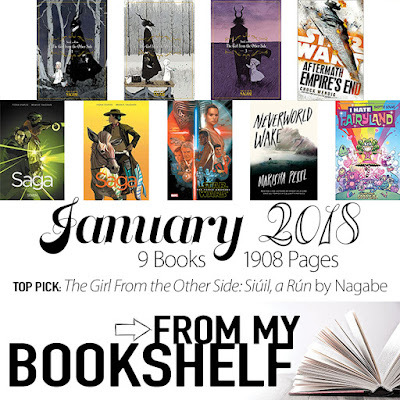 Almost all of her characters come from some life of ridiculous privilege and by halfway thru the book, I had grown very tired of hearing about it, because inevitably it felt like she needed to remind us of their privilege and untouchability. Maybe it was just me, but it felt a little heavy handed on Pessl's part. Add to that, unless I missed it, is there is no real explanation for what is happening to the characters. There's some half-cocked reasoning behind it all, but there is no solid answer to the question, "Why? Why does this happen? Why do these characters need to make this decision?" Maybe it was the fact that this book was far too easy to put down and that it took me almost all month to read it because it wasn't holding my attention all that well and by the end of the month and finishing the book, I wasn't entirely sure I remembered what happened at the beginning, and didn't care enough to go back to reread portions to get caught back up. I don't know, maybe others will find this enthralling, but for me, I just ended up having more questions than answers by the end. I feel like this should honestly be a 2 star book, but at the end of the day, I kept thinking about it more and more, so I guess that garnered it an extra star? Maybe? edit: Just kidding. Back to a 2 star it goes. And to be honest, I really wish I'd been reading the book being referenced to in Neverworld Wake far more than NW. Maybe someday, we'll get that book, because that one sounded intriguing as hell. I received an advanced print copy of this book from the publisher for a fair and honest review. I know this is an adaptation of the film, but when it is a word for word, scene for scene rehash with absolutely nothing new added, the redundancy of the project becomes wildly apparent. I guess I just expect to have something new added in to make it worth my time and money. I probably won't be picking up any future adaptations if they are this one dimensional. Collects issues 37 through 42. Collects issues 43 through 48. 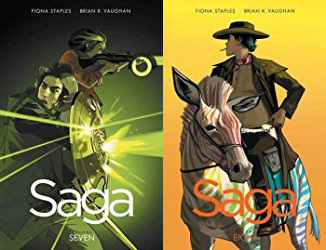 Saga is another series that continues to surprise me with how much I enjoy it. I did not like the first volume of the collected editions the first time I read it, and set the entire series aside in my head. Cut to about a year later, and a friend convinced me to give the series a try again, so I picked up the first volume again and something clicked for me this time - the story really stuck with me (Vaughn's writing really hit home for me the second reading), and Staples artwork is spot on perfect for this story. As the series has progressed, it has become way more timely and aware of what's going on in the real world today and bringing those themes into the story; themes of acceptance for those who are different (or lack of acceptance in some cases), trans rights, women's rights, etc. What started out to me as being a simple battle between two cultures who cannot accept each other's differences has become a story that is still about these problems, but one that is now holding up a mirror to what's going on in the real world. Staples art has continued to shine issue after issue and while there does seem to be a whole lot of nothing happening from one story arc to another, the storytelling is still strong and Vaughn continues to move the characters along, albeit at a slightly slower pace than I'd like, but it still seems to work. I'll continue to read this series as long as Vaughn and Staples continue to out out such strong work. 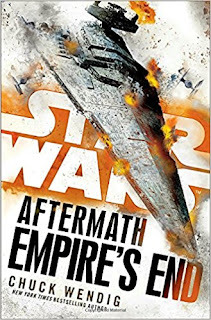 For as little as I liked the first book in the trilogy, Wendig's Aftermath story really grew on me, and there are some very tantalizing bits that I'm hoping will be expanded on in the future: Mentions of past events in the Star Wars universe that we haven't heard of before? What exactly was Palpatine looking for out in the area beyond the known galaxy? What did Brendol Hux and the other passengers of the Imperialis discover on their voyage, and how did that lead to the creation of the First Order? I know a lot of people were disappointed in the writing off of the Expanded Universe novels in favor of these in-canon novels, but I'm glad it happened. These novels have expanded on the movies and really add to the tapestry of the overall Star Wars universe in ways that the movies probably wouldn't be able to do, and the fact that they are all aware of each other and stick to the same storylines just adds volumes to the SW experience. 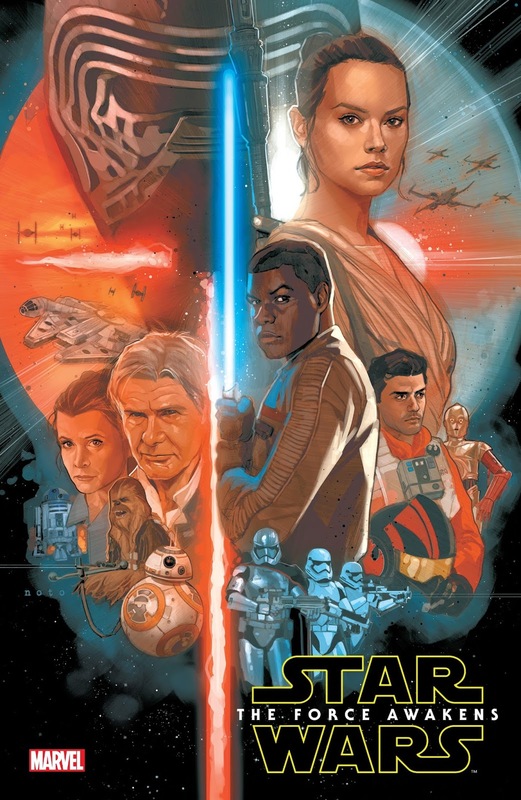 While I still wish that this entire trilogy had been released prior to the release of The Force Awakens as it really fills in some of the gaps leading up to that movie, the finished product stands strong on its own. And as much as reading Chuck Wendig's writing still bugs me (there's something about how he structures his sentences that drives me nuts when reading it, but listening to the audio works just fine for me - weird, I know) I hope that he is given an opportunity to flesh out some of the other plot lines that were left open or maybe give us some of the backstory to the events mentioned throughout the series from SW history. For fans of SW and especially the new trilogy of films, I think that this would be a necessary reading experience, and something that would still hold up well for the casual SW reader. The Girl From the Other Side: Siúil, a Rún is an all-new manga series that pulls readers into a magical and enchanting tale about a young girl and her demonic guardian. A haunting story of love and fantastical creatures, The Girl From the Other Side: Siúil, a Rún is a gorgeously-illustrated manga series. Each volume in the series will be released with a beautifully-textured matte finish cover and will include at least one full-color insert. In a world split between the Inside and the Outside, those living in both realms are told never to cross over to the other side, lest they be cursed. A young girl named Shiva lives on the other side, in a vacant village with a demonic guardian known only as “Teacher.” Although the two are forbidden to touch, they seem to share a bond that transcends their disparate appearances. But when Shiva leaves Teacher’s care to seek out her grandmother, the secret behind her mysterious living arrangement comes to light. In a world of those cursed who live outside the wall and those who live inside the wall in fear of being cursed, The Girl From the Other Side: Siúil, a Rún is a quiet fairy tale about a young girl, Shiva, who was abandoned in the forest by her aunt and raised by one of the Outsiders (those who are cursed) who she calls Teacher. Teacher goes to great lengths to protect Shiva from both other Outsiders and himself (all it takes is one touch from an Outsider to become cursed), and Shiva spends her days waiting for her Auntie to come take her home. Teacher knows that there is very little chance that Shiva's aunt will ever come to bring her home, so he tries his best to fill Shiva's days with lessons and fun. When a mysterious Outsider invades their home and touches Shiva, Teacher and Shiva embark on a journey to discover the source and possible cure of the curse. Unbeknownst to either, Shiva may be at the center of a prophecy of the church of those on the Inside, and Teacher may have to go extremes he didn't know possible to protect Shiva. But is Shiva a child of the Inside or the Outside, and is her role in the balance of darkness and light beyond Teacher's control? I absolutely love this series. The art is beautiful and the story is paced perfectly, a nice balance of quiet tranquil storytelling and the urgency that Teacher feels in keeping Shiva safe. The mystery surrounding Shiva and her role in the battle between the darkness and the light is intriguing. I will definitely be picking up subsequent volumes in this series.